The South Caucasus is a geopolitical region located on the border of Eastern Europe and Southwest Asia. The South Caucasus area spans the southern portion of the Caucasus Mountains and its lowlands, straddling the border between the continents of Europe and Asia and extending from the southern part of the Greater Caucasus mountain range of southwestern Russia southerly to the Turkish and Armenian borders and from the Black Sea in the west to the Caspian Sea coast of Iran in the east. The various ethnic groups inhabiting the Caucasus region. There are more than 50 ethnic groups lived in the region. 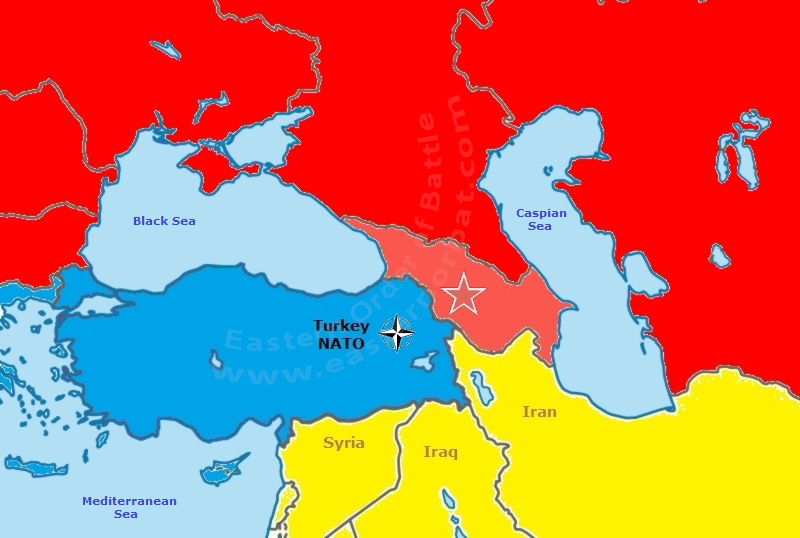 In the 60s and 70s the Soviet forces here faced the NATO member Turkey's military force, in the event of war relocating US Air National Guard units, as well as the US-backed Imperial Iran. The eighties had many challenges in store for the here settled the Soviet military units. Half of the 34th Air Army units regularly moved to nearby Afghanistan to fight. At the end of the eighties the Soviet Transcaucasian Military District's units participated in defeating the Ethnic Conflicts. The 4th Army, 7th Guard Army and 31st Army Corps were stationed in the District. The 34th Air Army supported these forces.